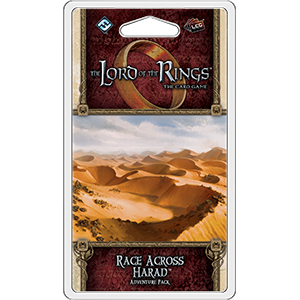 Race Across Harad is the second Adventure Pack in the Haradrim cycle for The Lord of the Rings: The Card Game. Meanwhile, even as the scenario from Race Across Harad brings this frantic chase to life, it enhances your deck-building options with a new D�nedain hero, plus three copies each of nine different player cards. These enhance a wide range of the game's existing keywords, Traits, and mechanics. You'll find support for everything from Mounts to side quests and from the Doomed keyword to the cycle's new focus on events that offer powerful rewards when you can target specific pairs of Traits.